We have seen increased interest in using black plastic silage tarps for stale seedbed preparation, a technique known as occultation or tarping. Our prior research suggests that solarization using clear plastic can also be used to create an excellent stale seedbed. We conducted two experiments to compare solarization to occultation, and during our second experiment measured the impacts of these practices on the soil microbiome. In the first experiment, we rototilled, irrigated the soil, and applied solarization and occultation (securing plastic edges tightly by clipping them to metal pipe) for seven weeks starting in April of 2016. Two weeks after plastic removal in early June, we counted emerged weeds. There was significant weed emergence in control plots, but zero weed emergence following both solarization and occultation. The field in which this experiment took place had been amended with compost before the trial began in April and was very high in organic matter (17.9%). This meant that we were actually performing “biolsolarization” – that is, coupling solarization with addition of organic amendments. Past studies suggest that biosolarization is often more effective at controlling pests than regular solarization, so this may have contributed to the excellent weed control we measured. We were curious how solarization and occultation compared when applied for shorter treatment periods, so we conducted a second experiment starting in early July of 2016. As before, we rototilled, irrigated, and applied plastic. This time we included seven treatments: solarization for two, four, and six weeks; occultation for two, four, and six weeks; and a control. Organic matter in this field was 3.7%, which is more typical than in our first experiment. 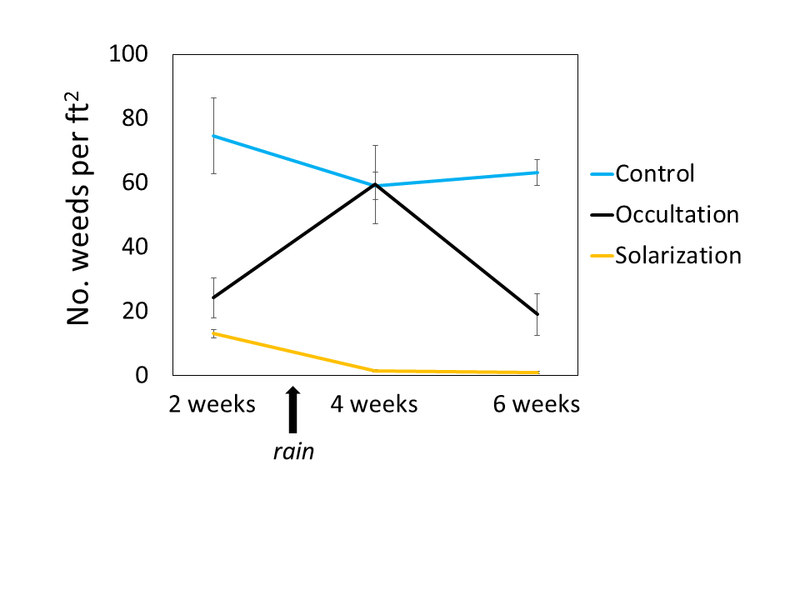 We measured weed emergence two weeks after plastic removal for each treatment, and found that solarization created a better (less weedy) stale seedbed than occultation for all treatment durations. Surprisingly, more weeds emerged after four weeks of occultation than two weeks. We think this was because overall 2015 was a very dry summer, but there was abundant rainfall during the two weeks between removing plastic and counting weeds in the four week treatments, which likely encouraged weed germination. The fact that the solarization plots did NOT respond the same way to rain suggests that solarization may have impacted weed seeds in the seedbank more dramatically than occultation, likely through a combination of direct seed death, fatal germination, and forcing seeds into dormancy. Soil temperatures were consistently highest in the solarized plots, intermediate in the occultation plots, and lowest in the controls. We expected this trend based on the physics underlying these soil heating techniques: clear plastic allows energy from the sun’s rays to directly heat water in the soil underneath, while black plastic absorbs the sun’s energy and re-radiates some heat to the soil below, but the energy transfer is not as efficient. 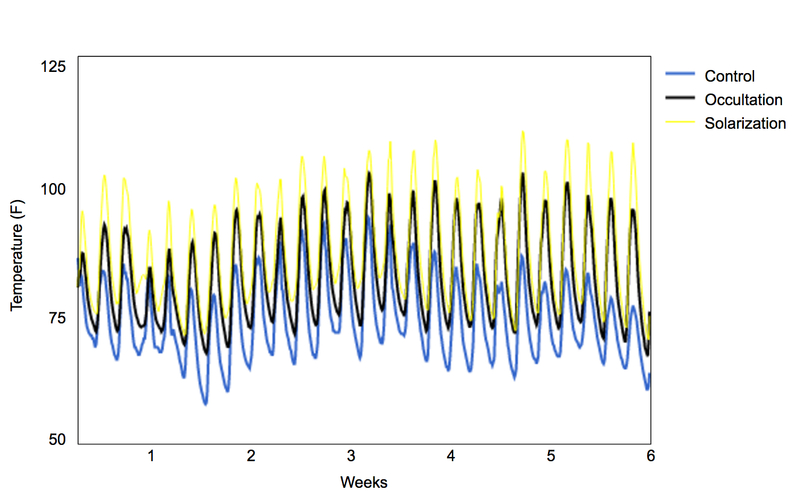 To explore the impacts of solarization and occultation on the soil microbiome, we measured soil biological activity before, during, and after four weeks of treatment. A soil microbiome consists of tiny organisms such as bacteria, archaea, fungi, and protists that are essential to plant life. Beneficial microorganisms convert nitrogen from the air into ammonium in order to render it useable by plants; protect against harmful microorganisms; and simply crowd out harmful microorganisms. Soil biological activity is essentially a measure of how much the soil is breathing, and is considered to be an indicator of good soil health. Soil biological activity was not significantly impacted by solarization or occulataion during treatment, but two weeks after plastic removal, soil biological activity was reduced in the solarized plots. Shown here are data from 0-1 inch soil depth. 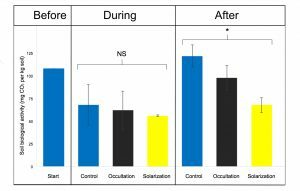 Treatment did not significantly affect soil biological activity during treatment, but soil biological activity was reduced in solarized plots two weeks after plastic removal. Soil depth (0-1 inch, 1-2 inches, and 2-4 inches) did not impact these results. It is possible that during solarization, natural selection changed the composition of microorganisms present in the soil, favoring heat-loving species. After plastic was removed, the heat loving microorganisms could have been at a disadvantage and declined in population faster than they were replaced by other moderate-temperature-loving species, so the overall soil biological activity decreased temporarily as a result. We expect that if we had been able to measure again a month or two after plastic removal, we might have seen soil biological activity return to pre-treatment levels. Beyond stale seedbed creation, occultation and solarization could be useful small-scale methods for terminating no-till cover crops. New research at UNH is looking into this application, with early results suggesting that occultation may have an edge when it comes to subsequent weed suppression. 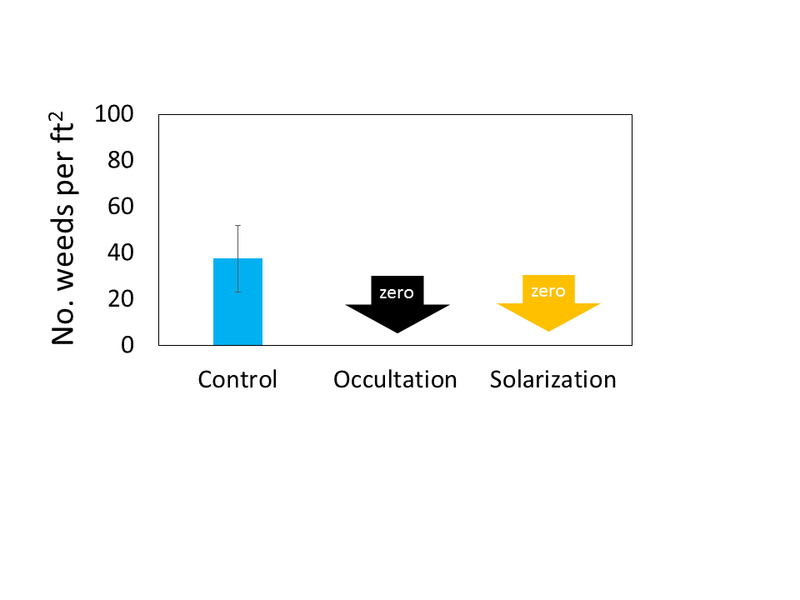 Overall, these two experiments suggested that solarization and occultation can both create effective stale seedbeds, but solarization appears to be more consistently effective than occultation at shorter treatment durations. Solarization may negatively impact soil biological activity, though we expect effects to be temporary; we’ll be posting results soon describing two more experiments that take a closer look at the impacts of solarization on soil microbes.